Savvy Mode: Fringe Tote: To Buy or Not 2 Buy? Fringe Tote: To Buy or Not 2 Buy? 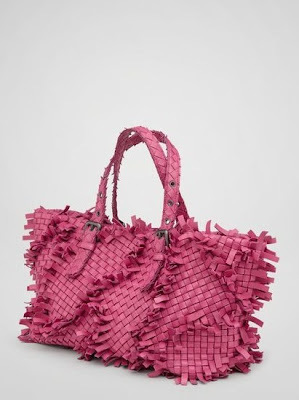 When I first saw this tote, it reminded me of the fringed tote from Bottega Veneta (see image below). I liked the weaved detail and the fun fringe element around the edges of the bag. Just as I promised myself no more tote bags, I found this. This particular style is fun yet still simple enough to act as an everyday bag. I was almost convinced the first one was BV! I also scrolled down to see the DB take on the "LV" Alma and Hermes "bolide"! Looks great and for an all leather handbag for $495 that is a way better deal! Me too when I first saw the tote but thought I didn't recall BV making anything like this. I actually like the second one better. But I think it might be because I love that color of pink. I love the pink one. Not sure about the first one because the used will get dated fast unlike the pink one where the fringe somehow blends - classic with a twist i guess. I like the first design. The pinkie is a real cutie! Both are gorgeous bags. I'd go for the grey one as it may work for more looks, but the pink one is incredible. I love the fringe on that bag best.